Board Chair, Amie Alley Pollack (Parent Elected) joined the Board in June 2015 and became the Board Chair in June 2018. Previously, Amie was the Board Secretary 2015-2018. Amie is from the United States and holds a PhD in Clinical Developmental Psychology. She is on faculty at Vanderbilt University (USA) and is a Visiting Professor at Vietnam National University. For the past 6 years Amie’s work has focused on the development of mental health research and training capacity in Vietnam and Cambodia. She works with universities, hospitals and ministries to design and evaluate mental health services and programmes and conducts research related to the impact of natural disasters on mental health. Previously she held positions with US universities and nonprofit organizations where her work focused on child mental health, trauma and models of community-based mental health care. Amie has two children at UNIS Hanoi. Board Vice-Chair, Ngo Thi Quynh Hoa (Board Appointed) joined the Board in June 2015 and became the Board Vice Chair in June 2018. Hoa has chaired the Advancement Committee (2016-2017) and is the member of the Committee on Directors since 2016. Hoa is a Vietnamese national with over 20 years’ experience of leading, managing and evaluating international development programmes and policy dialogues. She has held key positions with a range of organisations, including the World Bank, UN (UNDP and UNIDO), and the UK Department for International Development (DFID). Her work has contributed directly to the development of Vietnam, Myanmar, Cambodia, Laos and Timor-Leste. Previously a Fulbright Scholar, Hoa holds a Master’s degree in Development Economics from Williams College (USA), and two Bachelor's degrees, one in Education and Languages teaching from the Hanoi Foreign Languages’ Teacher Training College, and another in Banking and Finance from the National Economics University (Vietnam). Currently Hoa is working with UNICEF. Hoa has one child at UNIS Hanoi. Treasurer, Barry Knaggs (Board appointed) joined the Board in 2009 and became the Treasurer in June 2018. Previously he served as Board Vice-Chair (2015-2018 and January 2011-June 2014) and as Board Secretary (2010). Barry has also served as both Chair and committee member of the Campus Development Task Force from 2013-2018, Chair of the Advancement Committee in 2012-13, Chair of the Buildings & Facilities Committee in 2011-12, and as a member of the Strategy Task Force, Advancement Task Force and Committee on Directors in 2011-12, and Strategy Task Force in 2010-11. Barry has more than 30 years of experience in the IT industry, starting from being a software developer to project management, moving on to sales, business development and also managing IT companies in Vietnam. He is currently the General Director of a security monitoring joint stock Company in Hanoi. He is Malaysian and has four children, 2 are still at UNIS Hanoi. Board Secretary, Louis Vigneault Dubois(UN appointed) joined the Board in July 2017 and became the Board Secretary in June 2018. Louis was a member of the Campus Development Task Force 2017-2018. He is the Chief of Communication and Advocacy UNICEF Viet Nam. He oversees UNICEF's communication and advocacy agenda for children while working to enhance UNICEF's profile and image in the country and abroad. He also works within the broader UN Communications and Advocacy team in Viet Nam on specific communication priorities. Before taking on this assignment in 2015, he held similar functions working for UNICEF in Côte d’Ivoire (2010-2015) and in Liberia (2009-2010). Prior to joining UNICEF Haiti in 2008, Louis has lived in DR Congo, France and his home country, Canada. Louis has one child at UNIS Hanoi. He speaks fluent French, English and German. 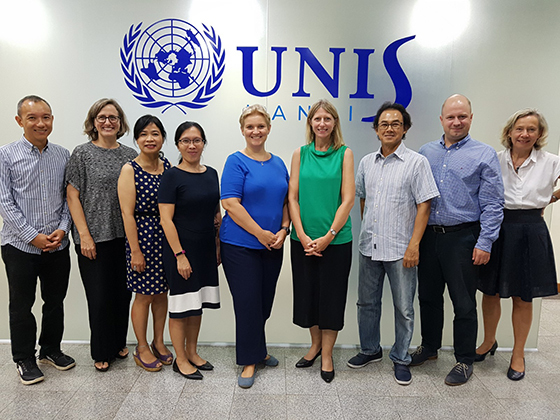 Catherine Phuong (UN appointed) joined the Board in August 2017 and is Assistant Country Director/Team Leader, Governance and Participation Team, UNDP Vietnam. Prior to that she was Deputy Regional Representative, Office of the United Nations High Commissioner for Human Rights (OHCHR), in Suva, Fiji, and prior to that coordinated a Rule of Law Programme for OHCHR in Cambodia. She has also participated in working groups on Human rights and legal advocacy groups in Geneva and lectured in Law at Newcastle University UK. Catherine studied Political Science in Paris, obtained a Master of Law in Durham University and a Ph.D from Nottingham that looked at the international protection of internally displaced persons. Catherine has two children studying at the French School in Hanoi. Paul Priest (UN appointed) joined the Board in November 2016 and has been a member of the Advancement Committee 2016-2017 and Campus Development Task force 2017-2018. He is the Head of the Programme Unit with the International Organisation for Migration (IOM) – the United Nations Migration Agency. Prior to arriving in Hanoi in April 2016 accompanied by his wife Lumi and two sons, Paul held the position of Associate Expert with the IOM Development Fund in Geneva, Switzerland. Born and raised in Far North Queensland, Australia, Paul also holds British and Canadian citizenship and has lived for extended periods in Papua New Guinea, the Sultanate of Oman, South Korea and Switzerland. Having attended an international school as a youngster, Paul has one child at UNIS Hanoi. Nguyen Van Hieu (Board appointed) joined the Board in 2011 and was the Board Chair from January 2015 to June 2018. Previously, Hieu served as the Board Secretary in 2012-2013, as chair of the Finance Committee in 2013-2014, as chair of the Buildings and Facilities Task Force in 2012-2013, and as members of both the Governance & Policy Committee and the Finance Committee in 2011-2012. Hieu worked for Oracle Vietnam in 1995 and later became its Managing Director until 2002. He then held a number of regional management positions in the Asia Pacific Region for Oracle based in Singapore until 2007, at which time he decided to return to Vietnam as an independent entrepreneur. Hieu has served on a number of small business board including a board of governor member for the American Chamber of Commerce in Hanoi. He is currently involved in health care and IT services. Hieu is Australian with a Bachelor of Electrical Engineering degree from the University of New South Wales, Australia. He has two children at UNIS Hanoi. Michelle Dinh Jones (Parent elected) joined the Board in June 2018. Michelle arrived in Hanoi in 1999 to work as a nurse trainer through a project at Viet Duc & Bach Mai hospitals. At the end of the project, she decided to re-train as a teacher and worked for the British Council, training primary school teachers. Michelle moved into Educational management in 2004 and became Country Manager for a large language centre with five training venues and over 100 expatriate teachers nationwide. In 2010, she started working as a manager for an international kindergarten in Tay Ho District. Now, in addition to owning and running the school, Michelle regularly delivers training on play-based learning and child led curriculum through the Department of Education. She also consults for a number of large independent Vietnamese schools wanting to incorporate play based learning into the traditional curriculum. Caryn R. McClelland (Board appointed) joined the Board in September 2018. Caryn is the Deputy Chief of Mission (DCM) with the US Embassy in Hanoi and began her assignment in Vietnam in September of 2017. Prior to this assignment, Caryn served as the Acting Principal Deputy Assistant Secretary in the Bureau of Oceans and International Environmental and Scientiﬁc Affairs in Washington, DC, and has also held senior diplomatic postings in Latvia, Indonesia, Azerbaijan and Malaysia. She has also served as a Senior Advisor to the Special Advisor to the President and Secretary of State for Caspian Basin Energy Diplomacy and as the Eurasia Regional Energy Ofﬁcer in Washington. Caryn received master’s degrees from the National War College at the National Defense University and San Francisco State University and a bachelor’s degree from UCLA. She has one child at UNIS Hanoi. Jane McGee Head of School August 2018. Jane is Canadian and holds a B.Sc. in Mathematics, a B.Ed. Intermediate/Senior Math and Science, and an M. Ed in Administration and Policy all from Queens University, Ontario, Canada. Prior to joining UNIS Hanoi, Jane was Head of School at Vientiane International School, Laos and was Assistant Superintendent at the American School of Bombay (ASB). Jane also held the position of High School Principal in ASB and High School Principal at the American School of Warsaw. Prior to that Jane has held positions as IB Coordinator, High School Counselor, Mathematics Department Head as well as Math and Science Teacher. Jane has over 25 years’ experience in senior administration and teaching in Italy, Egypt, Thailand, Poland, India and Laos.